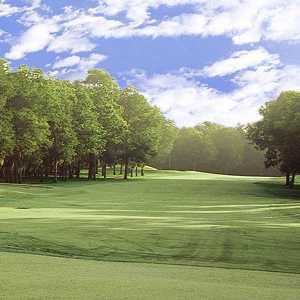 RICHMOND, TX -- The Houstonian Golf Club opened last year to impressive reviews. Golf Magazine listed it as a "Top Ten You Can Play" course. The friendly golf management staff, including head golf professional Michael Hoffman, were all smiles. But it did take a while before they could see the light at the end of the "tunnel". You see, an ornery critter kept messing up the No. 8 green. Carl the Greenskeeper from Caddyshack almost had to be called in to rid the green of a gopher. "It was pretty discouraging," said assistant pro John Saffle. "Every morning we would arrive and look at the damage and make repairs. We set out traps and would catch one thinking that was it. But it continued for several weeks before we got the real perpetrator." That night the staff jokingly wondered if Carl the Greenskeeper's friends at The Houstonian had gopher tacos. The gopher is gone, but he left a distinct darker green tint outlining his former traveling path -- just a reminder for all those involved. But it doesn't make a bit of difference in the conditions -- The Houstonian's greens are super rolling Tif Eagle. With notable, subtle-breaking greens, mature pecans lining rolling Bermuda fairways and 12 holes with water lurking, The Houstonian Golf Club will test you over its 7,110 championship yards at par 72. High-handicappers don't despair, there are five tee box selections -- play it as a stern test from the tips or have fun from just 5,375 yards. Rees Jones, son of Robert Trent Jones, Sr., designed the layout -- his first in Texas. "I think it is a very playable course from the forward tees," Saffle said. "We are constantly getting compliments about the greens and I think you get the 'wow effect' here. Climb up on one of the elevated tees and lots of golfers say 'wow' because of all the water." One can imagine that golf ball sales are booming at the Houstonian, especially when a high-handicapper looks at one of those forced carries. But the water isn't overwhelming -- if you hit the ball down the middle you won't have any problems. Simple, huh? You can even have the experience of the olden days -- caddies are available. "Our caddies wear full whites, just like you see at Augusta National, so you get the whole deal," Saffle said. You need to stay alert when you reach No. 13, a long par-4 at 403 yards and the No. 2 handicap hole, because the next five holes have reachable water. No. 15 is a 167-yard par 3 with water right and No. 17 is 207 from the tips with not much room for error left or right to an elevated green. No. 18 doesn't have water but it doesn't need it. Into a prevailing southerly breeze, this par 4 plays at 464 from the tips with a trap down the right that measures 140 yards in length. The Houstonian Hotel, Spa and Club, located in the heart of Houston, just minutes from Memorial Park and the Galleria, has been a center for luxury for many years. It was only fitting that the owners decided to include a golf course. Coloradans should be at home when entering the lobby, with a Great Room that resembles a Rocky Mountain hunting lodge. A huge rock fireplace is the centerpiece, burning even when it is 95 degrees outside. As you turn to walk upstairs on the mezzanine level there's a huge mural of an elk. The Houstonian Golf Clubhouse continues that hunting-lodge theme with 18,000-square feet and another burning fireplace in its restaurant. The Grille and Bar is available for golfers to enjoy a bite before or after their round or enjoy their favorite beverage from the bar. The golf course is open only to hotel guests and Houstonian Club members. Hotel guests get complimentary shuttle service to the golf course, which is 20-30 minutes away depending on traffic. Golfers also get complimentary valet parking at the course should they drive themselves, yardage book and bag tag. Hotel Amenities: There's 32,000-square feet of meeting space. Wedding function space is also available. The health and fitness country club is one of the best in Houston with 125,000-square feet of state-of-the-art training aides and personal trainers. There are three swimming pools. Dining At The Hotel: The Manor House is open daily for lunch, wedding rehearsals, dinner parties, anniversaries and corporate functions. Call 713-685-6840 for information. The new Olivette Restaurant specializes in Mediterranean food and is open for breakfast, lunch and dinner. Call 713-685-6713 for reservations. Directions to Hotel: Follow the signs for Airport Exit (I-45), which takes you down JFK Blvd. Exit I-45 South to the 610 West exit (Exit 51). Take 610 to the Woodway Dr. exit. Turn right onto Woodway Dr. then right again on North Post Oak Lane. The Houstonian Hotel, Club & Spa is at 111 North Post Oak Lane, on the left. 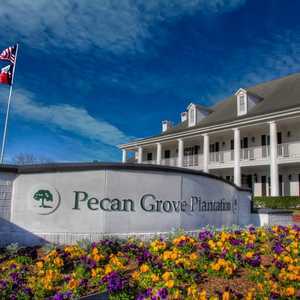 Green Fees: Hotel Guest and Houstonian Members, weekday $95. Weekends $115. Guests of Members, $115 weekdays, $135 weekends. Caddies $38. Fore Caddies, $20. Gratuity not included. The Houstonian has a junior golf program. Call for details. Directions: From Highway 59 take Grand Parkway north to FM 1464. Turn right on FM 1464 and follow the road 1.7 miles to the Golf Club entrance on the left. From I-10 take Highway 6 south toward Westheimer. Turn right, heading west on Westheimer. Turn left on FM 1464. The Golf Club is 5.6 miles on the right.